This freeway is the most commonly used route from Vancouver to Hope. Winding through the Fraser Valley, it provides access to Langley, Aldergrove, Clearbrook, Abbotsford, Chilliwack and other communities located on the south bank of the Fraser River. The districts of Abbotsford and Matsqui provide a centre for fruit, livestock and dairy farmers of the Fraser Valley and it's population of over 180,000. Abbotsford is 74 km (45miles) east of Vancouver on Highway 1. From Abbotsford continue east to Vedder Road. Take the south exit to Cultus Lake Provincial Park or the north exit to Chilliwack. 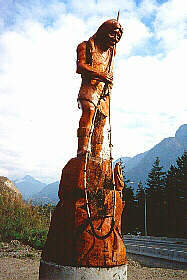 Situated in the Upper Fraser Valley, Chilliwack is 103 km (64 miles) east of Vancouver. This farm and dairy region offers excellent fishing opportunities in the nearby lakes. Featuring exhibits of Canada's military engineers dating from 1608, this museum is located at Vedder Crossing. 13km (8miles) from Highway 1, via Vedder Road, is one of the most popular parks in Southwestern B.C. Cultus Lake Provincial Park offers excellent picnicking, camping, swimming, fishing and hiking opportunities. Traveling east along Highway 1 you may wish to take a side trip to Minter Gardens or take Highway 9 across the Fraser River to Agassiz and Harrison Hot Springs (the north bank, Highway 7). Minter Gardens provides the visitor with eleven gardens, including a rose garden, a fern garden and a Chinese garden. It is located north off of Highway 1 at 52892 Bunker Road. 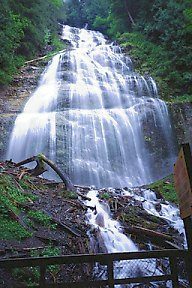 Located 16 km (10 miles) east of Chilliwack, Bridal Falls provides attractions such as the theme park, Dinotown,water slides, bumper boats, a golf and country club and a large campsite. These 6th highest falls in the country stream into Bridal Creek and the Fraser River through the Cheam Lake regional Nature Park. You will see Mount Cheam (2107m or 6910 feet) above Highway . You may also wish to visit the Skagit Valley Provincial Recreation Area. To reach this part of the province, take Hope Business Route, exit south to connect with Flood Hope Road (old Highway 1) or go further east and exit at Silverhope Creek. During 1848-49, this was a Hudson Bay Company fort so that this was an all-British route was established between Fort Kamloops, on the Thompson River and Fort Langley on the Fraser River. Hope is located at the junction of Highway 3 (the Crowsnest Highway) and Highway 1, (entrance to the Fraser Canyon), in a beautiful valley surrounded by impressive mountains. Christ Church: This Anglican Church is one of B.C. 's oldest (1859) and is located in downtown Hope. This park is located 5 km (3 miles) past Hope via the Kawkawa Lake Road. Follow this well marked route to the remains of the Kettle Valley Railway, four tunnels and two bridges in this canyon gorge. This railway line was constructed to link the coast with the Kootenays.